A pulley is one of the six simple machines that human beings use to help them lift and move objects. 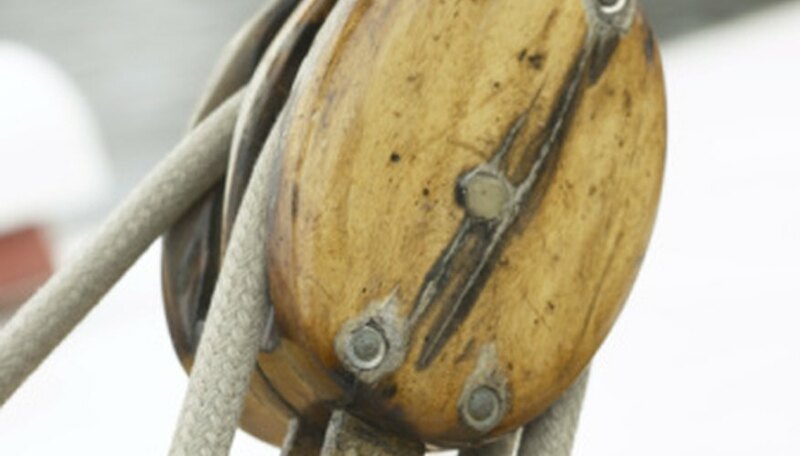 All pulleys consist at a basic level of a wheel with a rope strung around it. Depending on the pulley arrangement, a pulley may either provide a mechanical advantage that allows a heavy load to be lifted with less work, or it simply allows the same amount of force to be applied in a different direction. Other pulley systems may allow both of these benefits. 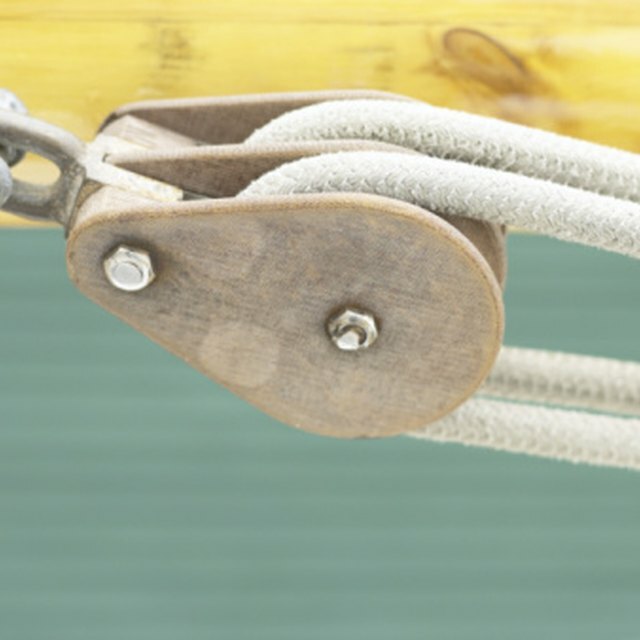 The wheel of a fixed pulley system is attached to a solid structure such as a wall or a floor, while the rope is free. This means the pulley itself is stationary. A fixed pulley offers no mechanical advantage but does allow a person to redirect the force. So rather than directly lifting a heavy object up, a person can use a pulley to instead lift the object by pushing down on the rope. The wheel of a moving pulley is not attached to any particular surface; instead, the rope of the pulley is attached to a stationary surface. Unlike a fixed pulley, a moveable pulley does offer a mechanical advantage. A heavy load is attached to the wheel rather than the rope, and as the rope is pulled the wheel slides up the rope, bringing the load with it. This requires less work than lifting the load directly would require. A compound pulley consists of both a fixed pulley and a moveable pulley. This combines the benefits of both a fixed and a moveable pulley. In a compound pulley the weight is attached to the wheel of a moveable pulley, which itself is strung to a rope attached to a fixed pulley. With a compound pulley you can redirect the required direction of the force as well as the total workload for the force. A block and tackle is a specialized form of compound pulley that can dramatically lessen the required amount of work to move a heavy object. A block-and-tackle pulley system consists of several fixed and moveable pulleys arranged parallel with one another; fixed pulleys aligned with fixed and moveable pulleys with moveable. Each compound pair is attached to the next pair, and each set reduces the total work required. This pulley system is popularly attributed to Archimedes, the famous ancient inventor and mathematician. The cone pulley is another specialized pulley system that incorporates the basic mechanics of a pulley system while allowing for mechanical adjustments. A cone pulley is essentially multiple pulley wheels of decreasing circumferences stacked on top of one another, forming a cone shape. This cone shape allows the pulley operator to shift the speed of the pulley's movements, with a smaller circumference requiring less work but also producing less work. Multi-gear bicycles essentially operate on this same system; the bicyclist can easily shift between smaller gears that move the bike less, and higher gears that require more effort but move the bike a greater distance per revolution. Chris Burke began writing professionally in 2007. In addition to writing for student-run literary journals in college, he has authored content for The George Washington University, as well as the Association of American Colleges and Universities. Burke holds a Bachelor of Arts in international affairs and is pursuing a law degree from Columbia University. Burke, Chris. "A List of the Five Types of Pulleys." Sciencing, https://sciencing.com/list-five-types-pulleys-8673129.html. 24 April 2017.